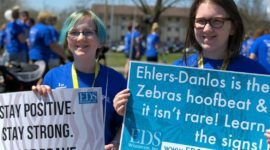 Isolation – EDS Wisconsin, Inc. It made me laugh for a second. If you have EDS and have ever parked in a handicapped parking space without needing a wheelchair, you have probably had at least one person tell you not to park there. 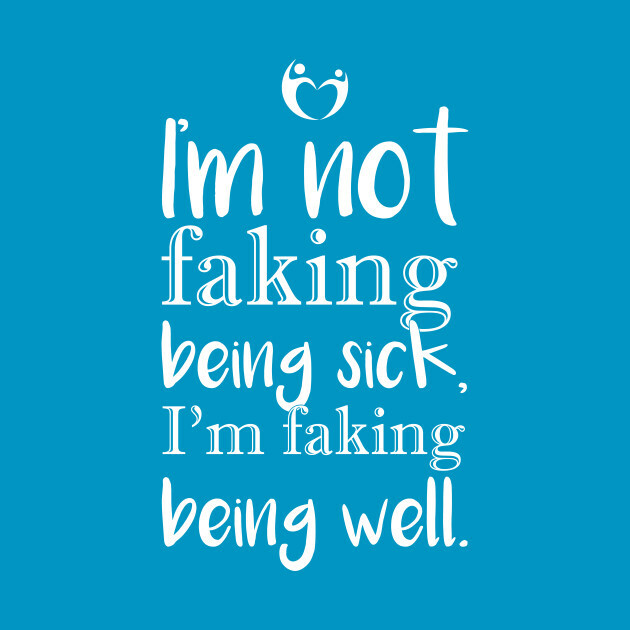 I have been accused by multiple people of seeking attention or pretending things are worse than they really are. After I laughed, though, I started crying. You see, my pain has been absolutely out of control lately. I started a new job just under two months ago and my doctors and I already decided I can’t physically handle it. I have pushed myself every single day to get to my office and do my work, smiling and greeting people through pain, all the while my medications getting less and less effective and my wheelchair becoming more and more necessary. I used to come home after work at night and be able to enjoy myself. Now, less than six months in to my marriage, I find myself coming home from work and wanting to do nothing but lay in bed and watch TV because my body hurts so much. I work primarily in an office. I sit primarily behind a desk. Most people who see my at my job would never even guess that I get home and often choke back tears asking my husband to work knots out of my muscles and then cry as he has to push on the really painful spots because that’s the only way to get rid of them. I quit my job. It broke my heart. I am not someone who quits a job after two months, but I know I cannot do it and I need to accept that, but I am still overcome with guilt thinking of what inconvenience I have caused others. I am someone guilty of measuring my value by my productivity and I do not feel productive. I was back home over this past weekend for a family funeral. We lost a wonderful man. It was absolutely devastating–and the first time my extended family really saw me in my wheelchair. It was the first time my parents saw what happens to me after a full day of activity now. It was the first time people close to me realized how truly exhausting it is just to exist in a body that doesn’t work right. Between the emotional and physical pain, I am still tired almost a week later. Why am I writing this post that seems like me just whining about how hard it’s been to be me lately (even though I promise you I actually do like being me)? Because it can be lonely here and it should not have to be. I am making a conscious choice to share these massive struggles with you, because I’ve read the struggles of others lately and I do not want them to feel alone. I want to remind the world that just because someone has pretty makeup on and a cute outfit doesn’t mean they aren’t in incredible pain–in fact, that makeup and clothing might be their best effort to hide it. I want the others who are currently in pain that feels out of control to know there are others who are laying in bed wishing they could go do something and feeling guilty for holding others back. I am 28 years old and I cried on my mother’s lap this weekend about wishing I had a normal body. Kids with EDS feel that way, too. They need to know it’s okay to feel that way sometimes. They need to know not to live there. They need to know sadness and grief over their condition is natural, but isolation is dangerous. They need to cry to a parent or a friend instead of hiding their pain until they cannot bear it anymore. We lose chronic pain patients to suicide because their mental health becomes too great a burden as they wish and hope for a “normal body” and have no outlet for those emotions. I have made many mistakes in the last few months. I have overlooked the struggles of others while enduring my own. We must all work to see pain in ourselves and pain in others. We must avoid the loneliness and isolation of chronic pain and chronic illness. We must allow our emotions to have an outlet before they take control. When you lose another thing in your life because of this crappy condition, you are allowed to be angry. You are allowed to be sad. Your life, though, it is still beautiful. You are still wonderful. I think you will find in recognizing others’ pain, you may find relief and comfort for yours. I may not be able to do the jobs I hoped I could do. I had dreams I can no longer achieve due to my physical limitations, but I also have new dreams I wouldn’t have if I didn’t have EDS. I’m going to work on those for a while. I’m going to remind myself of all the beautiful people in the world who don’t care if I look pretty and say I hurt; they believe me anyway (and want to know the name of my eyeshadow palette so they can look pretty through the pain, too). Remember: I am here. We are here. Stay here. Thank you. I kinda needed this. My life is kind of isolating right now. It’s hard to go do stuff, and don’t have many good friends nearby right now. I’ve been fortunate that my mom recently retired and she lives near me and my husband. She’s been coming over almost everyday and just hanging out. She’s been making it fun to be lazy when I need to. I’ve just felt that I’ve been keeping her from doing fun things, but I need to remind myself that she’s here because this is where she wants to be. Thank you! Gentle hugs! Moms really do want to provide that comfort for us, regardless of our age. Sometimes, finding a way out of isolation might not even mean something in real life; I find so many wonderful connections through the internet. On horrible pain days like today, I make sure to reach out to my EDS friends and snuggle with my two dogs while I’m unable to work and my husband is gone.